There is never an end to a tool list but here is a good starting point. Breaker bar, 1/2″ will handle most jobs but the breaker bar should be matched to the socket. If you using 3/4″ socket use a 3/4″ breaker bar and so on. 5/8 spark plug wrench like the one in the manual photo, this may be found in your bikes tool kit. Nitrile gloves to keep engine oil and other fluids off your hands. 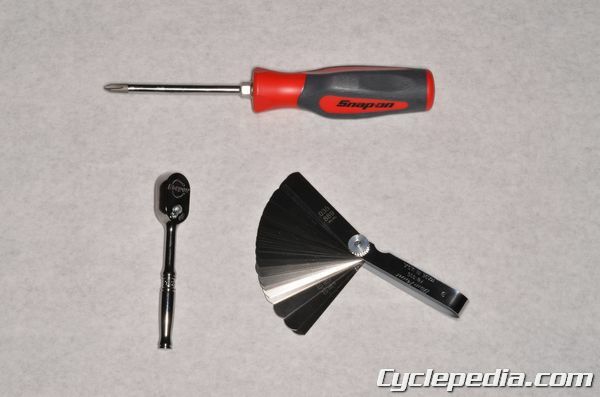 Some of these tools may be purchased as a set and some may need to be purchased individually. Try to purchase high quality tools as they will pay for themselves over time. From here various extensions and socket sizes may be needed. Some other useful items such as compression gauge, drill, drill bits, fastener extractors, tap & die set, air impact guns, air compressor, tool box, garage more bikes, ATV’s Side by Sides, I could go forever but you get the point. Remember go slow, read over the procedure first if possible and think safety!